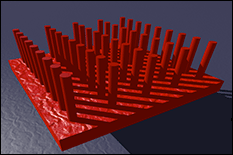 Nanowire solar cell yields higher efficiency by focusing light into the device. For a more complex nano-solar cell design, efficiencies >40% are predicted compared to only 30% for a traditional solar cell. Assistant Professor Jeremy Munday (ECE/IREAP) and electrical and computer engineering graduate students Yunlu Xu and Tao Gong have designed a new type of nanoscale solar cell that they predict could outperform traditional devices by as much as 40%. This new technology could revolutionize the solar industry by allowing for significantly more power generation from a single device by simply making it much smaller. Xu, Gong, and Munday had their research on the Shockley-Queisser limit for nanostructured solar cells published in Scientific Reports. Scientific Reports is an online, open access journal from the publishers of Nature. The journal publishes scientifically valid primary research from all areas of the natural and clinical sciences. The Shockley-Queisser limit describes the maximum solar energy conversion efficiency achievable for a particular material and is the standard of comparison for new photovoltaic technologies. For a standard solar cell, this efficiency limit is ~33%. However, recently people have wondered if nanoscale solar cells are also bounded by this limit. Now Xu, Gong, and Munday have shown that a single-junction nanostructured solar cell has a theoretical maximum efficiency of ~42% under typical solar illumination. This exceeds the efficiency of a traditional planar device but does not exceed the Shockley-Queisser limit for a planar device with optical concentration, e.g. a solar cell using a lens to concentrate the light. The researchers found that nanostructured solar cells offer an important avenue to achieving high efficiency photovoltaic devices through a “built-in optical concentration.” Even when they consider the effects of light scattering in the atmosphere, nanostructured solar cells can achieve 35.5% efficiency with a modest built-in optical concentration of only ~1,000.